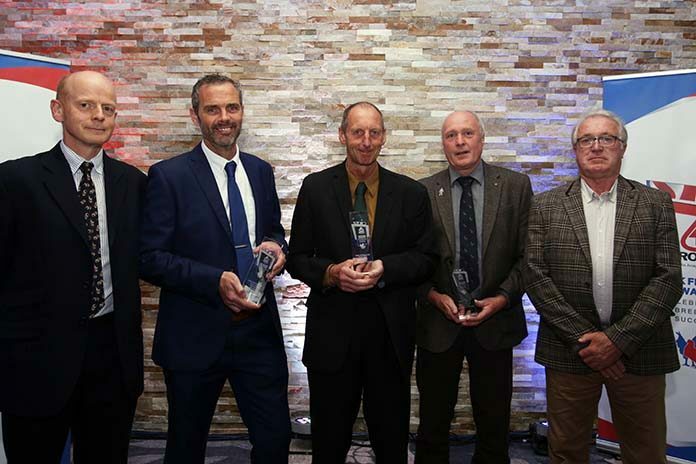 Aviagen® recognized and rewarded 27 winners at the 18th Ross® UK Flock Awards, held at Tewkesbury Park in Gloucestershire on May 30, 2018. The champions of the Flock Awards are breeder managers, hatchery managers and rearing farm managers. Alan Thomson, general manager, Aviagen UK Limited, shared a review of the past year, pointing out that Ross parent stock (PS) performance objectives had been both achieved and exceeded. Such results contributed ultimately to 3 percent of national annual broiler flocks, with outstanding breeder success passed on to the next generation of broilers. The top award this year went to Corbett Farms for Cargill Meats Europe – and, says Richard Corbett, “We are immensely proud to win this award. It is a reflection of the skill, dedication and hard work put in by all of our team.” Richard’s winning formula is “to listen, share and not to be afraid to walk your own path.” The winning team included Mike Ball, breeder farm manager, Dave Williams, rearing farm manager, and Phil Harris, hatchery manager. Among the award recipients, seven first-time winners were joined by repeat winners such as Rhonda Rice from Banham Poultry, who has had no less than seven successful breeder flocks. Average experience of this year’s award winners was 22 years, ranging from just 24 months all the way up to 41 years. When interviewed, Ross Flock Award winners gave profound insights into what it takes to create a top flock: Some cited passion and an ability to “listen to the birds” to ascertain what they needed. Others put success down to teamwork, attention to detail, nutrition and good management. Careful observation of the birds, good egg quality and top fertility were also given as reasons.